One side of the room is for sitting, chatting and watching TV. A clever custom wood panel covers the TV when it’s not in use, so the room can look as period-perfect as possible. On the other side of the room, an Atlas Industries wall unit turns this space into a midcentury office, allowing the homeowner to work from home and select favorite books to read when cozying up on the couch. One of the standout features of this multipurpose room is the wood paneling on the walls. Reminiscent of Mad Men, the luan walls are deep and rich, speaking of luxury from the first glance. If you’re thinking about adding wood paneling to your own walls, choose a color that will bring warmth but not darken the room. Lights help with this—small spotlights can illuminate and brighten the walls, especially if you don’t have much natural light. Before you order the paneling, make sure you place a large sample in the room to get a feel for how it will look at different times of the day and night. Of course, no midcentury home is worth its salt without classic furniture. This room sports several such pieces, including a Cherner desk chair, Poltrona Frau sofa, Pierre Guariche armchair, Jens Risom coffee table and David Cressey table lamp. Though there are no Eames lounge chairs or Noguchi coffee tables, the style and feel of the furniture speaks to that classic design of comfort and simplicity so central to the modernist designers. 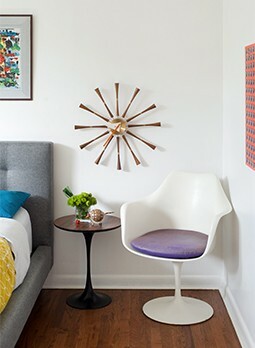 Even if an Eames molded chair isn’t in your budget, you can create this same look with newer pieces that replicate this design feel.